Express your romantic side by decorating your home for Valentine's Day with these love themed DIYs that are perfect for your home all year round. Serve up dessert at home on cute heart mini cake stands that are an adorable way to up your presentation of the grand finale of your Valentine's Day meal. To make your own attach a wooden heart plaque and candlestick together and paint them both a solid color to create your own mini cake stand. If you have a Silhouette machine you can recreate this forever ever pillow by downloading the free cut files from Craftaholic Anonymous which can be used to cut white and gold heat transfer vinyl that you can iron onto any accent pillow. Recreate the look of when you were younger and carved into a tree the initials of you and your love by crafting a birch bark candle holder complete with a hand carved heart. Have your children help to make these eye-catching red glitter XO using paper mache X and O available at craft stores which can be painted in Mod Podge and covered in red glitter for an easy Valentine's Day decor. painted in Mod Podge and covered in red glitter for an easy Valentine's Day decor. Set the table this Valentine's Day by making these modern white leather placemats that are shaped like hearts. The best part of this DIY is it only takes minutes to do and does not require any sewing to make your own set of placements! Surprise that special coffee lover in your life this Valentine's Day by giving them a hot cup of coffee wrapped in this cute printable coffee cup wrapper. Love wine? If so decorate your home by making a heart accent out of corks that would look amazing when paired on a tray of champagne and chocolate covered strawberries this Valentine's Day. Hang this soft fluttery heart wreath in your home this Valentine's Day. To make your own cut out a large heart out of cardboard and cover the cut heart using small circles of red tissue paper. This DIY heart pillow is so fun that you might want to keep it on your sofa all year round. If you are looking for a way to decorate your home for Valentine's Day try adding this set of industrial X and O letters which can be made out of paper mache letters and would be perfect on a bookcase, mantel or coffee table. Create a stunning temporary heart wall art using strips of washi tape to create a giant heart. Use up some of your extra bits of fabric from various crafts by creating a Valentine's Day garland that you can use year after year. What is there not to love about a simple DIY? Make your own romantic art by putting on various shades of lipstick and kissing a sheet of paper to create your own kiss art. Surprise the love of your life by painting edible hearts onto their plate by creating your own edible paint out of sugar, water and food coloring. Toss a luxurious faux fur heart pillow onto your bed or couch to add some romantic flair to your home for your Valentine's Day at home date night. Spend your Valentine's Day snuggling with your special someone on the sofa a homemade xoxo throw blanket while watching Netflix. This adorable throw is made by painting Xs and Os on a muslin blanket with craft paint, and all the easy to follow DIY details can be found at Lovely Indeed. They say the way to someone's heart is through their stomach, so what better way to spend Valentine's Day together than cooking up a romantic meal together at home? To get ready for your date night in the cooking together, add some cute romantic decor to your kitchen such as these handmade heart tea towels to add some Valentine's Day flare. Grab a roll of your favorite washi tape and make a decorative heart wall art that is simple to create and is perfect if you want to do some last minute Valentine's Day decorating. The geometric heart design looks so chic that you might just want to leave it up on your wall all year round. Showcase your favorite memories together as a couple by using copper wire to build a heart photo holder that can hold a single photo. Either build one or create a few photo holders for a small grouping that would look perfect on a desk, mantel or as a centerpiece for your Valentine's Day dinner at home. Toast to your love for each other on Valentine's Day with these super cute heart glasses that would be the perfect way to serve cocktails. To make your own grab the heart template at Sarah Hearts which you can use to cut the vinyl heart that can be temporarily placed on stemless glasses. Decorate your home by making a sparkling script love sign to hang in your home. Are you going to be spending Valentine's Day apart from your love? If so why not video chat them with this super cute 3D heart background behind you. Make your own inexpensive heart background for all your Valentine's Day pictures or video chats by reading the full tutorial at How About Orange. Fill up one of the empty walls in your home by making this pixel heart wall decor that is made by sticking washi tape in a grid format to form a heart shape. 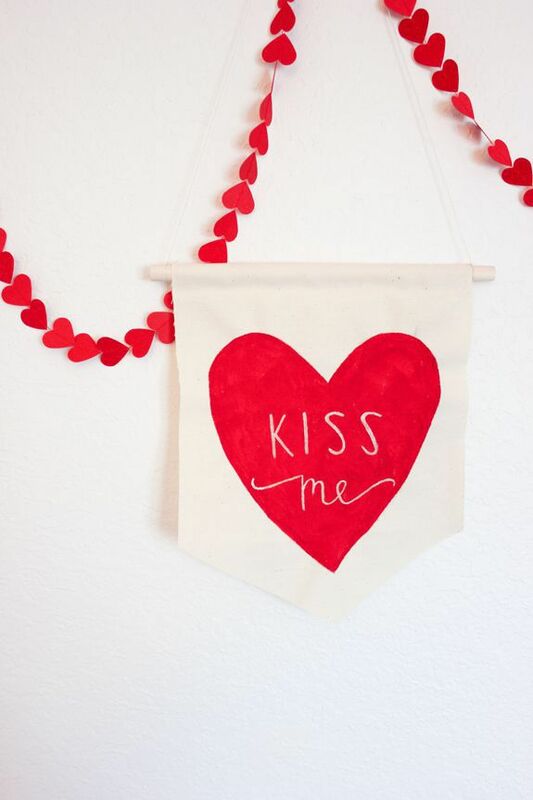 Get ready for Valentine's Day by assembling your own fabric hanging art that reminds your love to kiss you. Cut triangles out of all your leftover colored scrapbooking paper and assemble them to form a giant heart which you can frame and hang on your walls for easy non-cheesy Valentine's Day decor. Update one of your old fabric toss pillows to be more romantic by adding a giant gold leather heart in the center of it.